Because they live in Zamboanga City, I rarely see my parents and siblings in person, except during some of the longer holidays when I get to go home. As such, it always delights me when they venture a trip to Manila. It’s a chance for us to catch up and bond. Last week, while my father and my brother, Mark, were in town, we made it a point to at least have a hearty meal out together. 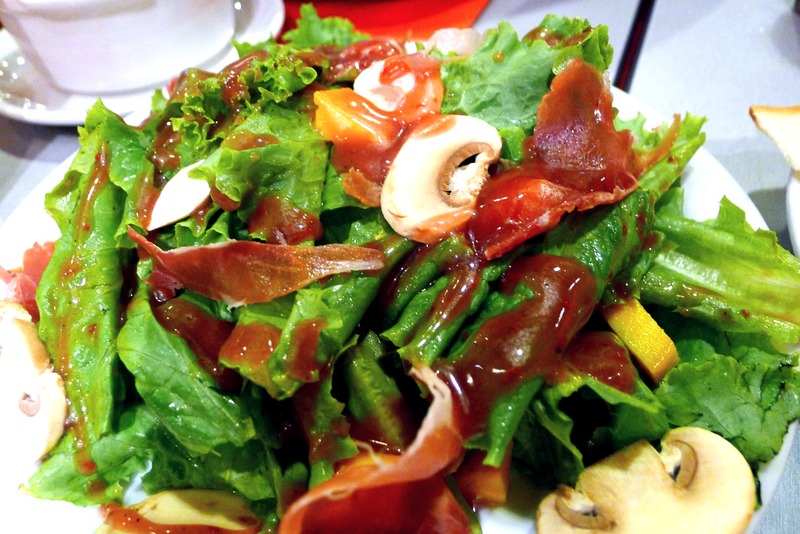 My aunt, with whom I currently live with, took us to Eastwood and thereafter, PASTO for dinner. For our antipasti, we had the Pasto version of the Crostini. 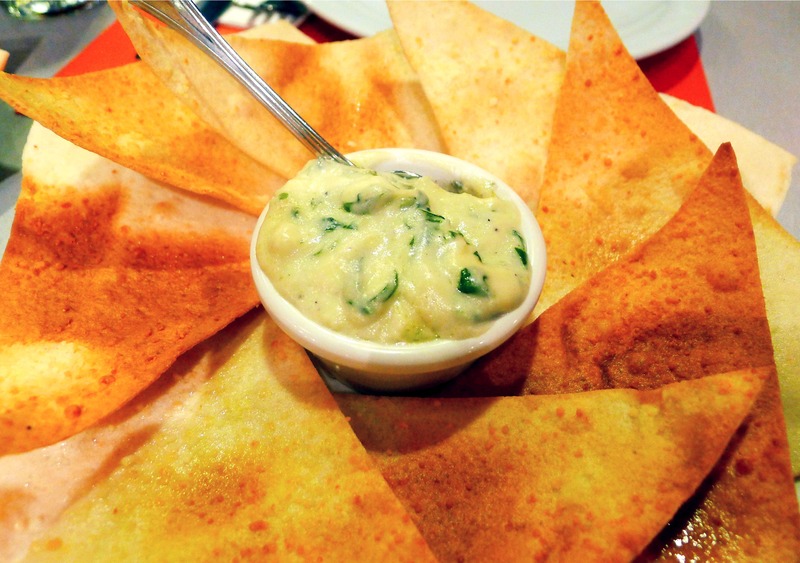 Our choice of dips were Spinach-Gorgonzola (PHP135) and Pomodoro Salsa (PHP105). Loved the Spinach-Gorgonzola dip! It was so tasty and a perfect foil for the crunchy Crostini. 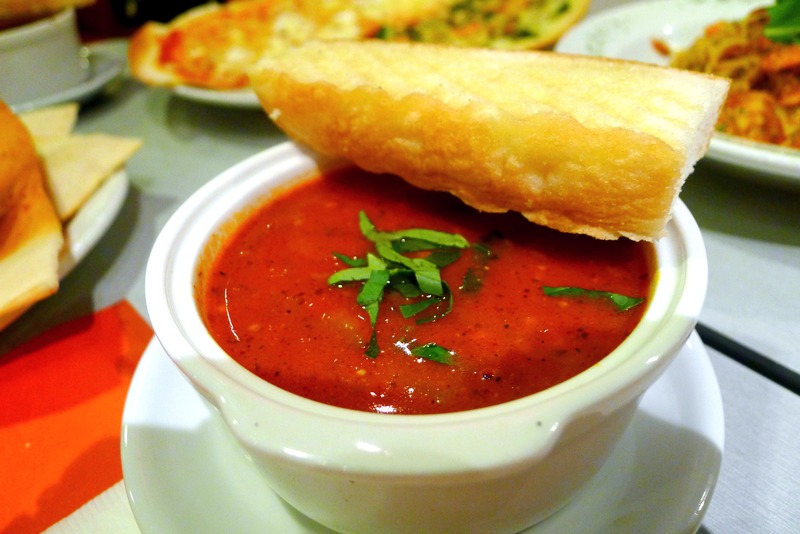 For our soup, we each had a bowl of Minestrone (PHP135) – an Italian vegetable soup with a tomato base. My brother did not enjoy it since he found it sour but my dad, aunt, and I quite liked it, especially when accompanied with bread or the Crostini! As part of our main course, we again shared these two plates of pasta. 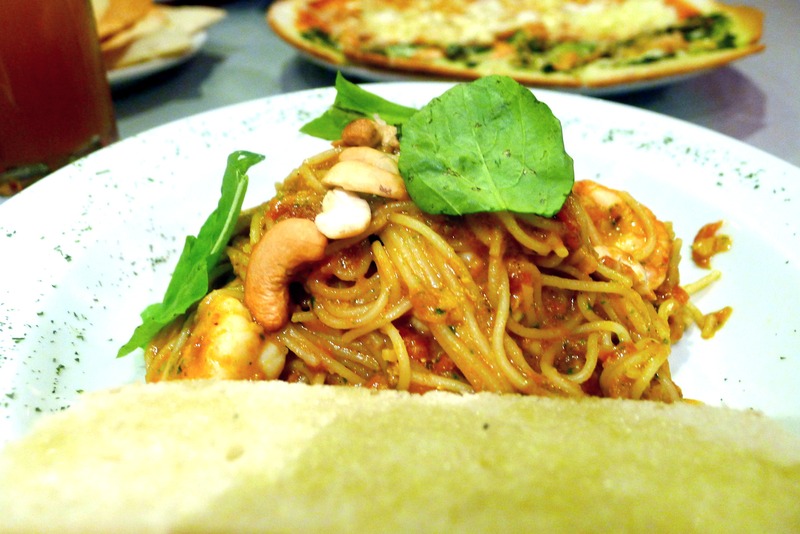 The first one is called Genevose (‘Capellini with shrimps, arugula, pesto and pine nuts in a tomato-cream sauce’) and the second, Frutti di Mare (‘Linguine with assorted seafood in an olive oil-white wine reduction’). 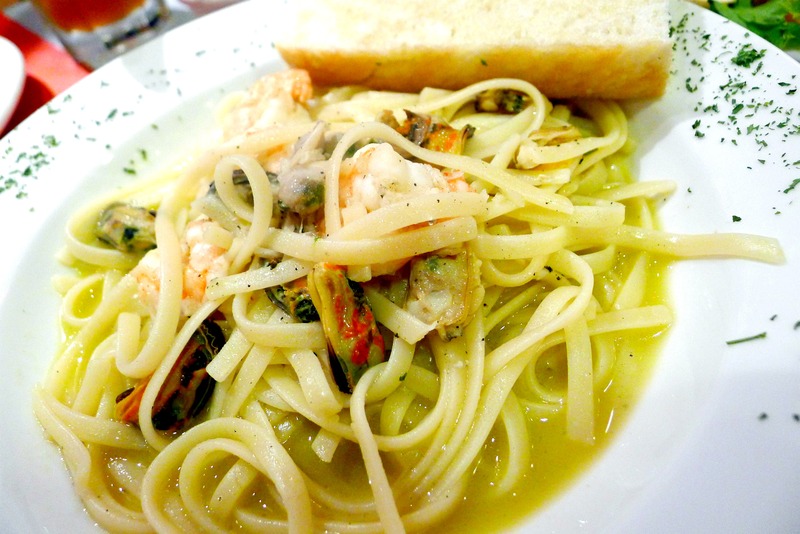 Both have seafood in it because my dad was craving for them. Personally, I thought the pasta needed to be a bit more al dente but I liked both nevertheless, especially the creamy Genovese. And as if all that weren’t enough, an 18-inch pizza was also ordered. My aunt was struggling between two “flavors” and was happy to find out that we can actually have both in one pizza. 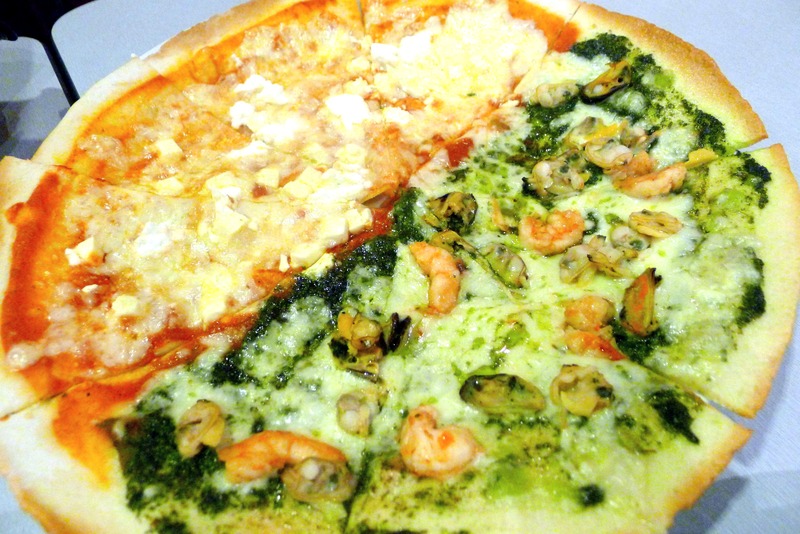 One half is formaggi (four-cheese – feta, ricotta, mozzarella, and Parmesan) and the other is Bianca, which is a pesto-based pizza topped with a mix of seafood. We truly enjoyed our meal hear and it was indeed very hearty. We were all so full we didn’t have any more room for dessert! 🙂 I would definitely recommend this restaurant. Check out their Facebook page for information about their latest deals. 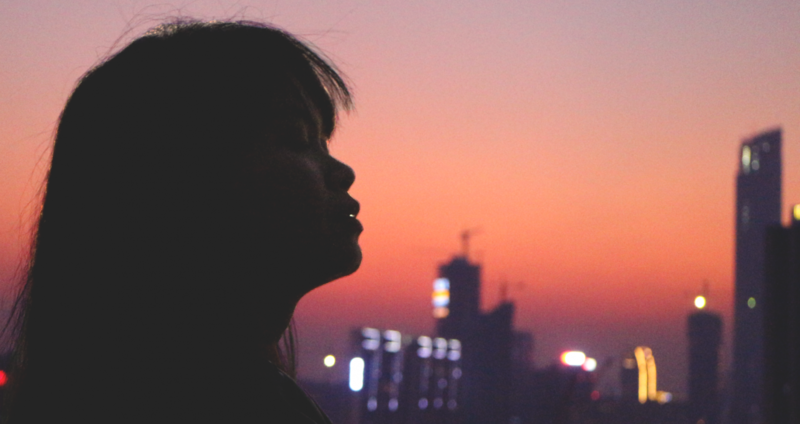 Previous Don’t Stalk Me; Stalk My Blog! 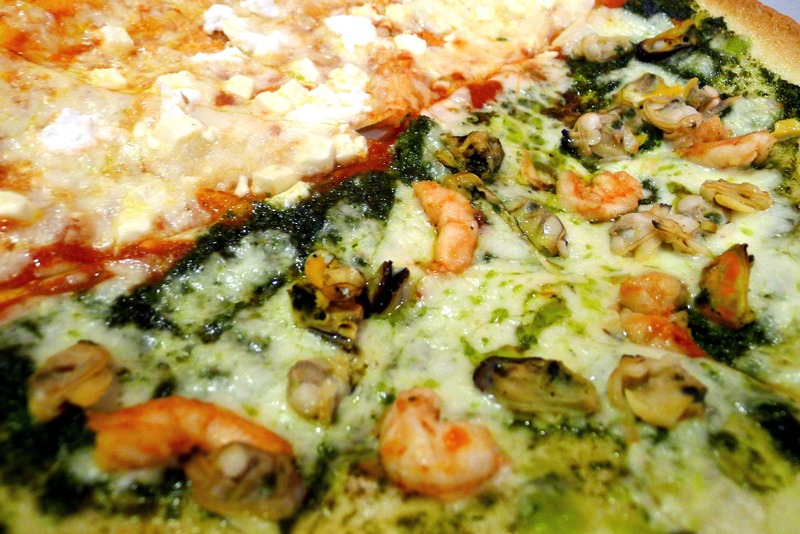 woo, sarap ng pizza and pasta!! i would def try the food, thanks for posting!